Serious baseball players tend to avoid Walmart as a go to option for upper end baseball bats. We are guilty of that—often looking to the likes of our favorite online bat retailers. We tend to like the home grown feel of many of them and talk about them often on this site. Walmart, however, through their supplier and seller chain (much like Amazon) has revamped their bat section now provides almost any bat you want. In other words, baseball bats at Walmart run as deep and wide as you need them to. For example, want one of our favorite 2019 USA Bats? Check the Demarini CF Zen drop 10 at, of all places, Walmart. What are the best baseball bats at Walmart? But, many of those higher end bat’s require you to wait a few days. We want our bat and we want it now. We wondered what is the best bat you could get at Walmart today. We live within driving distance of about 25 different Walmarts. We used their search feature that allows for ‘Pick Up Today’ and ranked the best bats in each category we could find today. Here’s our list. For direct pickup today we found over 7 different models of BBCOR bats. Frankly, more than a few we’ve never heard of before. They all looked like lower end single piece aluminum bats that we’d generally suggest to avoid for serious baseball players. However, we did find one store that had some Rawlings 5150 in stock today. That’s a 2019 Rawlings 5150 that many rate out as their favorite aluminum single piece BBCOR bat on the market. (See our full Rawlings 5150 Review). In terms of what was in stock today that’s the only thing we saw which excited us. Otherwise we think you’d do better somewhere else. If you’re willing to wait 2 days to pick up in the store (or just have them ship it to your house for free) then the world is you’re oyster. 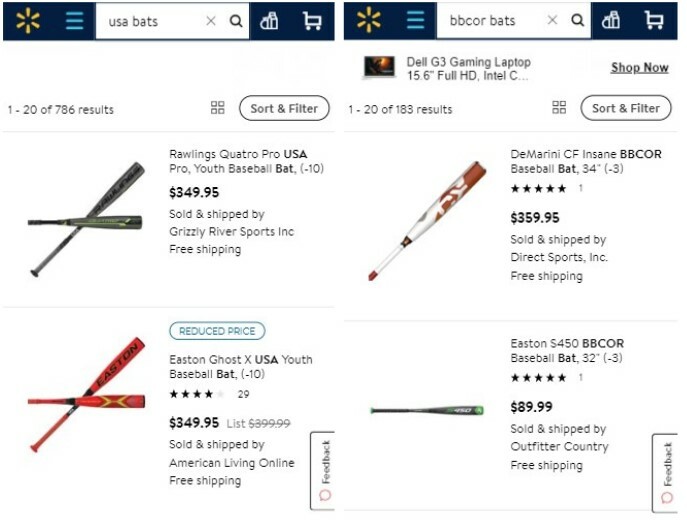 In fact, our favorite 2019 BBCOR bat can be found at Walmart. That’s right, the 2019 Rawlings Quatro can be right down the street for you in a day or two. Although it was in limited sizing, we even found the 2019 Slugger Meta Prime—which was also one of our Best BBCOR bats. Serious players know exactly what this bat is. This one appeared directly at our home and would have taken a few days later. But, there it was–the bat most consider the best bbcor bat right at good old fashioned Walmart. (See our full 2019 Slugger Meta Prime Review). It may have been the time of year we were searching (right at peak sold out season of mid-april) but there was very limited in store stock of USA Bats. We did see a Rawlings Fuel Metal drop 8 which actually swings really well for a $35 bat. If you aren’t looking for much–and your player is comfortable with a drop 8 bat–then you’ll struggle to beat the Rawlings Fuel Metal USA bat. But, if you’re looking for something a bit more serious in the USA Walmart bat space you’ll need to wait 1 to 2 days for the bat to show up in the store. But, if you are willing to wait a bit you can get just about whatever you want. We couldn’t find a bat you couldn’t get. It does appear, however, that Rawlings and Mizuno do a better job with Walmart’s distribution. Bats like the USA Rawlings Quatro and the full compliment of high end Mizuno USA Bats are all over Walmart. Our favorite of the bunch, in terms of overall value, is the Rawlings Threat. The bat was one of the best USA bats for 2018/19 and has a great light swing. This is perfect for the young player whose parents, frankly, think Walmart might be the only place to buy bats. Young kids who are yet to be in the deep throws of the baseball space and have yet to be open to the world of niche companies selling bats. There are some legit options as a walk in customer of Walmart. We found a Marucci F5 showing in stock at a store about 30 minutes from us. Hard to believe, we know. But there is in all its glory. In fact, the Marucci F5, after tons of hitting, is our favorite Junior Big Barrel bat. We found a bunch of other virtually nameless bats in the USSSA bat space. Not nearly as many drop 10’s as we like to see. Our experience is that a drop 10 is the real sweet spot for the USSSA bat space. But, like BBCOR and USA Bats above, you can just about any bat you at a Walmart store if you’re willing to wait a couple days. Every Rawlingn and Marucci bat we could think of was available on a 2 day shipping (or free to your home). Any DeMarini or Slugger or Marucci bat could be found on their site and shipped to your for free.